It's Free to Personalize the card with a first name on the inside, if you would like. Who has the beet! A fun card with a musical beet tapping her feet to the music on her headphones. Isn't she adorable with musical notes floating over her, she is totally in the zone. These are 5.5" by 4" and come with an envelope. Order your card with a blooming leaf. The little leaves attached to my Vegetarian Greeting Cards will bloom wildflowers when planted. You simply soak the leaf in water overnight, tear it up, and plant under a thin layer of soil. A note with directions for planting your blooming leaf will be included with each order. You also have the option to add a personalized message or saying on the inside of the card. This allows you to put a poem, funny or just some quirky message on your special card. 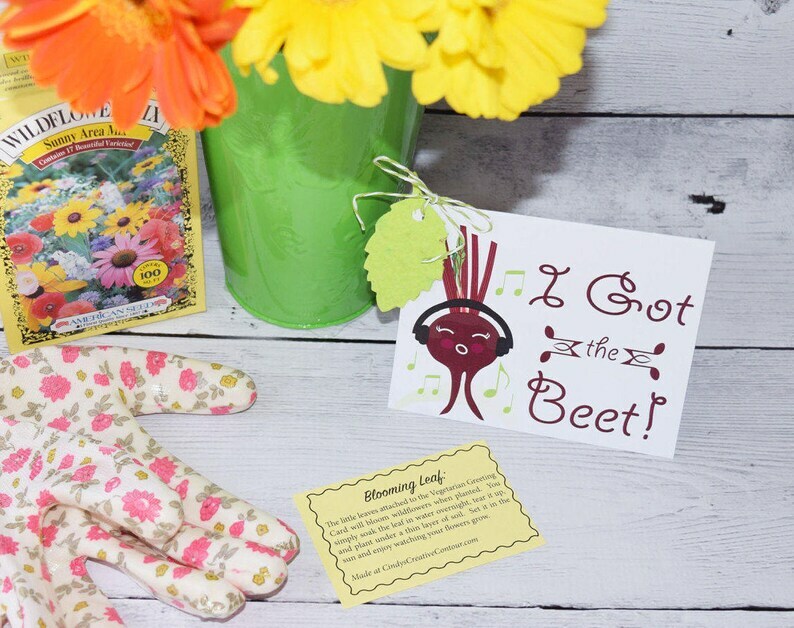 A note with directions for planting your blooming leaf will be included with each order.